Amarnath Yatra is one of the most awaited pilgrimage tours of Hindu devotees. 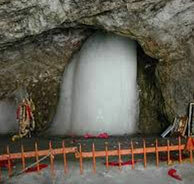 It is a special tour that is conducted during every year in July to the holy ice Shivlinga in Kashmir. If you are planning to go for the tour and wondering from where you can get it arranged, we have an excellent tour designed for you. Taking this 3 nights and 4 days tour will take you to a heavenly religious amidst in the valleys of Kashmir. This deluxe category houseboat offers a luxurious stay in Srinagar. The houseboat boasts of exquisitely carved traditional wooden work and befitted with modern facilities and services to offer its guests utter comfort and relaxation. The accommodation will be provided in the pre-arranged tents. On arrival at Srinagar Airport, meet our representative who will transfer you to Baltal while witnessing the charming views of Sonmarg. On arrival at Baltal, check-in at the pre-booked tent for overnight stay. Meals: No breakfast, but dinner will be served at Baltal. Early morning proceed for trekking to Amarnath Holy cave for Darshan of Ice Lingam. After Darshan, trek back to Baltal and relax overnight in the tent. After having breakfast, depart for Srinagar. On arrival at Srinagar, check-in at the pre-booked houseboat. If time permits, you can go for peaceful Shikara ride in Dal Lake or sightseeing in Srinagar. Return to the houseboat and relax overnight. Enjoy leisurely breakfast and Transfer in time to the airport to connect onwards destination flight.